When I heard that Fantagraphics was publishing a graphic novel loosely based on Dulle Griet, the 16th century oil painting by Pieter Bruegel the Elder, I was intrigued. Bruegel’s art has always been fascinating to me because of its scope and its sheer chaos. Every painting I’ve ever seen of his work seems packed to the brim with characters, each doing something strange or unique; the resulting sum is often cacophony. 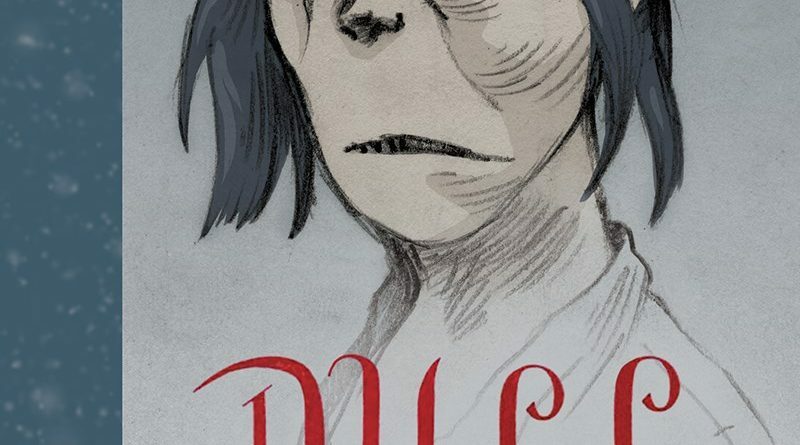 Jim Broadbent and Dix’s new graphic novel Dull Margaret, is certainly not cacophonous, but it is a dark, vicious reimagining of 16th century peasant life with a remarkable main character. The titular character Margaret lives a life of solitude in a boggy marshland, catching eels and selling them at market. Her life is full of hard work and backbreaking effort. When she is robbed at the market, her desire for revenge becomes overwhelming. 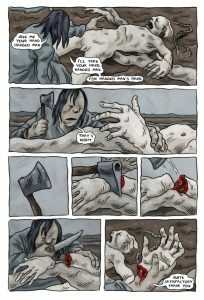 Using items she has found/harvested with magical significance (a hangman’s noose, a hanged man’s hand, a dog’s head, etc.) she casts a spell to find riches and companionship. While she finds both, she can either have one or neither. 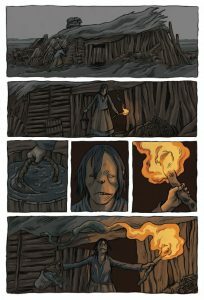 Dix’s illustration is decidedly dark and often vile. The palette is gloomy, dark greys, blues, and greens. The only reds are deep crimson, the color of blood. 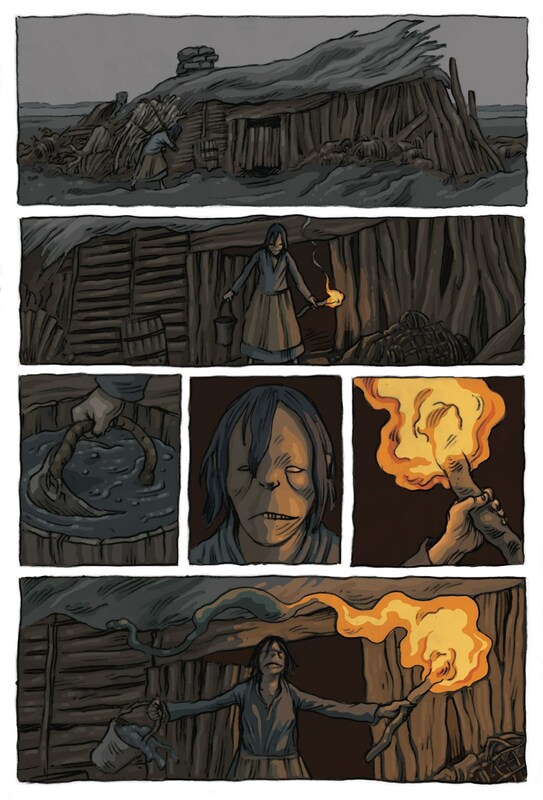 The image we see of Margaret is one that feels less like a human and more like a golem; her grey skin and pupil-less eyes give her a savage, alien complexion. 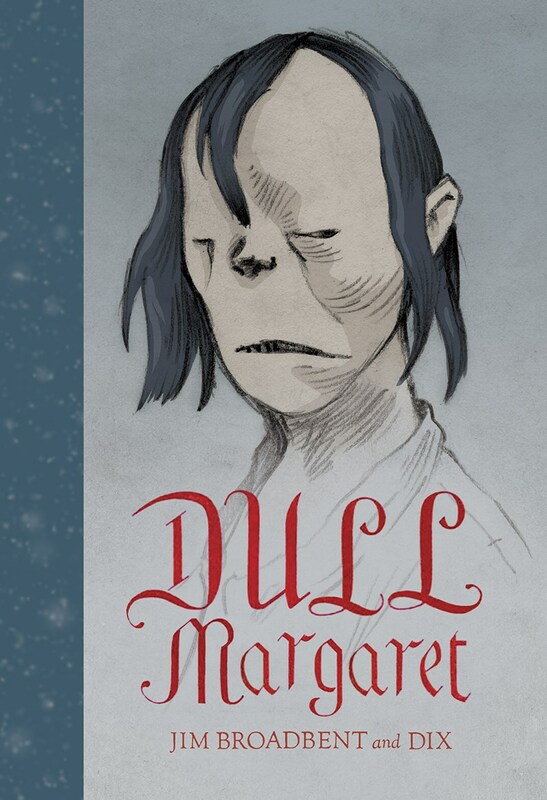 The cover image of Dull Margaret highlights this strangeness, with eyes and mouth like slits and clumpy hair. 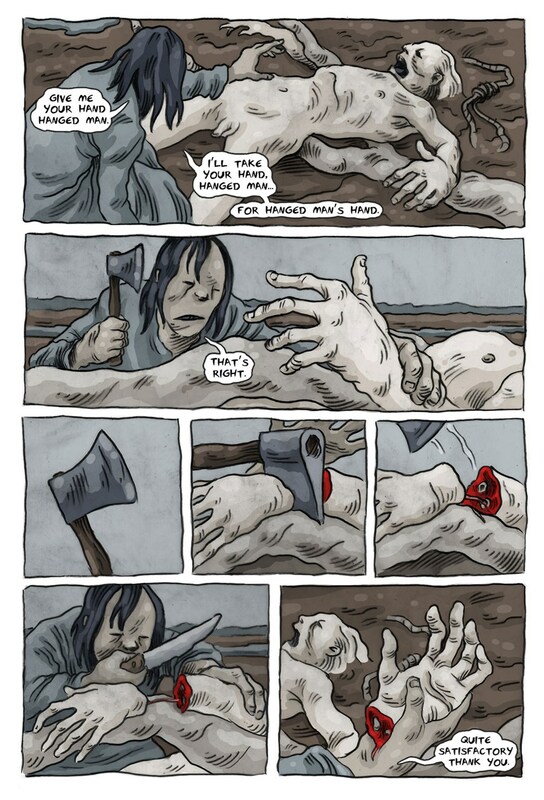 Dix’s art is generally unsparing, kind neither to its characters nor to its readers. 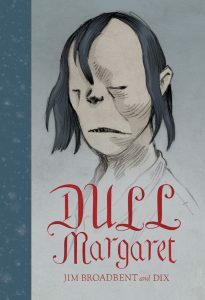 While Dull Margaret isn’t pleasant to look at, the illustration is quite effective, and so is Dix’s page construction and panelling, which helps a largely-wordless narrative move. Fantagraphics has given the book a deluxe treatment, with hardback binding and crimson gilding, which is an interesting juxtaposition for a book about an impoverished peasant. Despite her strange alien look, Margaret is wholly human. She is greedy and vengeful, longing for human affection, but unsure what to do with it. She is sometimes simple and sometimes crafty. She hurts everyone around her. She performs unspeakable acts with glee, and grieves in the face of loss. Broadbent’s character writing, at least for Margaret alone, is remarkably complex. All other characters are merely stage props for her one-person play. That observation is what shines through most – that Broadbent and Dix have created a comic that reads like a play written for one person. Broadbent’s character acting influences much of the tenor and construction of the book, including Margaret’s evocative, deranged monologue. 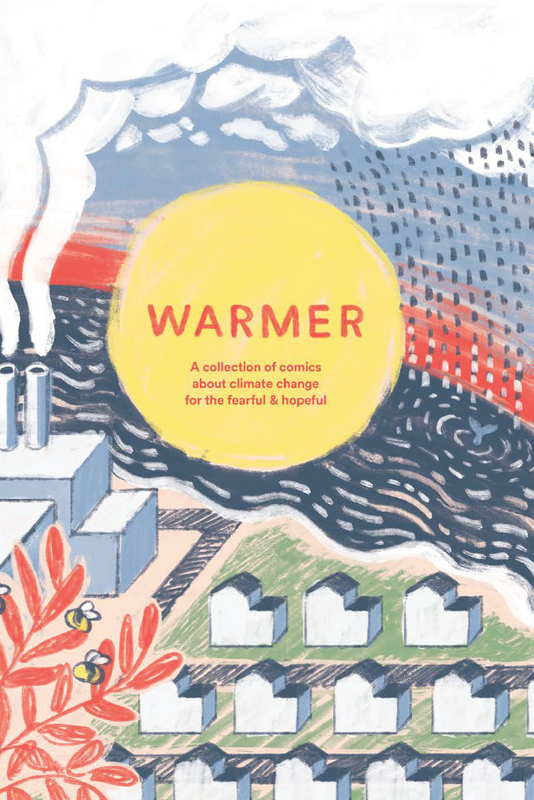 Dix’s illustrations have a sort of uncanniness, as though the work is being performed on a stage on the page. To me, it’s clear that the play of Dull Margaret is less a Broadway story and more a Brothers Grimm-style fable, a dark meditation on greed. Whether that meditation is effective is up for debate.